As leaders we spend so long researching, understanding, weighing up the pro’s and con’s of an idea / initiative – that by the time we come to a point where we are ready to fully engage those around us it can be quite difficult to empathise with the fact that they are looking at something for the first time, the way we ourselves indeed did at the beginning of the journey, and they may not necessarily immediately be blown away or jumping for joy at what they’re hearing. Hence we find ourselves afflicted with ‘the curse of knowledge’. Why don’t they get it? Isn’t it obvious? THIS is the way forward! Sound familiar? That’s how I feel about iPads in education. It’s difficult sometimes to appreciate that other colleagues are right at the beginning of their ‘tablet’ journey. But let’s be clear – I’m no expert – technology is an endless journey, and I’m at the beginning of my apple one! However, I feel I’ve learnt so much in such a short time. So how did our Apple journey begin? Well in 2011 we were at a point where our existing technology was starting to slowly fall apart. Laptop batteries were packing up and refusing to work, keys had fallen off keyboards and we were continually having issues with the ‘administrative rights’ gremlin. We had no apple technology in school at all. In fact in a primary school of 420 pupils with over 50 members of staff we collectively had one iPhone between us! So we looked at tablet technology. Lots of it! To our leadership team iPads seemed good but relatively expensive so we purchased ‘cheap’ imitations from places such as Amazon and quickly realised that these were a complete waste of money. Every avenue we explored brought us right back to the iPad. They were quick to boot up, efficient, had a ridiculously long battery life, had endless app’s to engage learners, could be stored discretely, but, what amazed us the most was the incredible support structure that was available through Apple. Premium resellers, Apple distinguished educators, Regional Training Centres, Leadership summits, incredible web support…..the list was endless. So very different to the ‘sink or swim’ culture that came when Windows PC’s were first introduced into our classrooms. We bought 6 iPads and used them in small groups. We focussed our money on developing expertise with a small number of staff so that they could eventually train others. To get people onboard with the initiative we devised simple tasks. e.g. competitions between staff and pupils – here are three questions how quickly can you find the answer? – teacher you go use a desktop PC, pupil you go use an iPad. Who can find the answer first? The children always won – sometimes by as much as four minutes. Sometimes the teachers came back with wrong answers! They had been so frustrated waiting for their computers to turn on they’d made mistakes! We found Apps that would get people excited. Simple ones like Explain Everything, Comic Life, WordFoto – that were quick to understand and easy to use. At Christmas time we used the videostar app to recreate Band Aids – ‘Do they know it’s Christmas time?’ to show to the pupils. Simple things that had big impacts on the staff engaging with the technology. 6 iPads quickly became 12 which became 30, which became 120. We now have 200. Teachers would hold model lessons and we’d invite other teachers to come and observe. Before they came in we’d ask “what do you think the iPads can be used for?” Always the responses would be limited – research? emails? taking pictures? Having watched theses sample lessons where our experienced colleagues would use a variety of apps – puppet pals, iMovie, tellagami, morfo, garageband, green screen FX – we’d ask the same question. 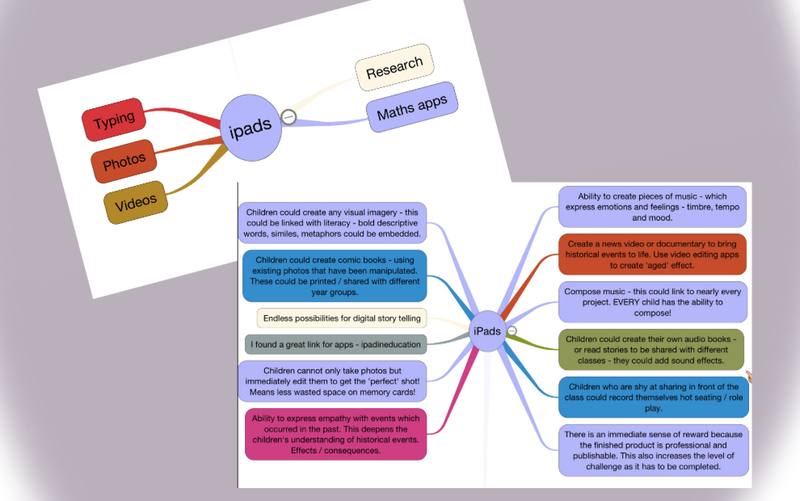 The responses then would be filled with endless possibilities and the potential of the iPad in their own classroom. They were desperate to get started! 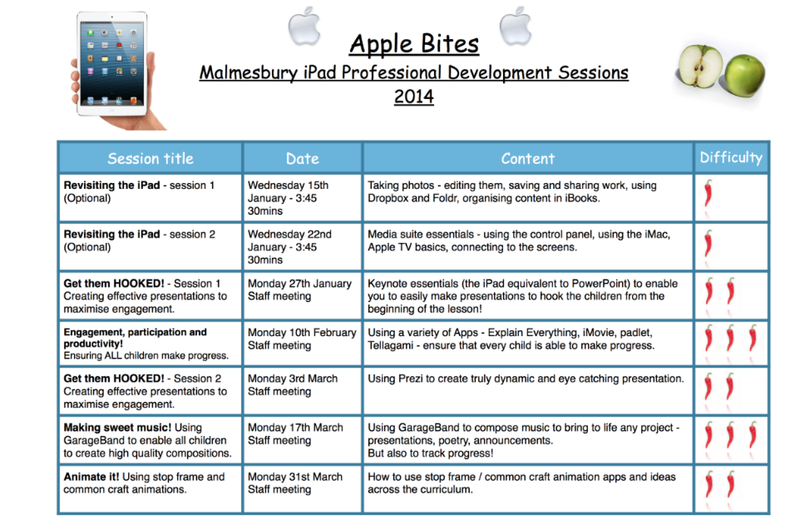 We now plan regular CPD throughout the year. The ‘WOW factor’ has to be maintained and so we pencil in three to four ‘Apple Bites’ sessions per term – focussing on using them across the curriculum, for assessment for learning, for pupil engagement, for participation, collaboration etc. etc. Some of the lessons I’ve learnt along the way? 1) Don’t expect to get it right every time! We’ve made plenty mistakes along the way, and I’m positive there’ll be many more to come! 2) Get every member of staff an iPad. Their confidence and engagement is vital! 3) Ensure you buy from a supplier with the skills and expertise to support you. 4) Have a clear vision of what you want to achieve. 5) Create pockets of success ‘Bright Spots’ that can be replicated throughout the school. 6) Make the journey fun. Avoid elitist ‘them and us’ technology cultures. We’re all in this together! That’s just one school’s perspective on Apple in education. I hope it was useful.